I am not yet a proper musician; but I have more aptitude for the calling than probably many of the younger generation have as a rule. It gets knocked out of you. 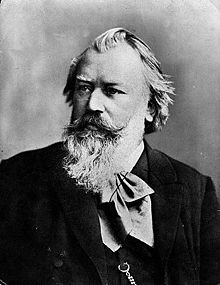 Johannes Brahms (7 May 1833 – 3 April 1897) was a German composer and pianist, and one of the leading musicians of the Romantic period. How lucky is the man who, like Mozart and others, goes to the tavern of an evening and writes some fresh music. For he lives while he is creating. High on the mountain, deep in the valley, I greet you a thousandfold. It always saddens me to think that after all I am not yet a proper musician; but I have more aptitude for the calling than probably many of the younger generation have as a rule. It gets knocked out of you. Boys should be allowed to indulge themselves in jolly music; the serious kind comes of its own accord, although the lovesick does not. How lucky is the man who, like Mozart and others, goes to the tavern of an evening and writes some fresh music. For he lives while he is creating. I wish I could write to you as tenderly as I love you and tell you all the good things that I wish you. You are so infinitely dear to me, dearer than I can say... If things go on much longer as they are at present I shall have sometime to put you under glass or to have you set in gold. If only I could live in the same town with you and my parents... Do write me a nice letter soon. Your letters are like kisses. There is so much that is true in your letter — if not all— and I must confess that with remorse and regret; but with pleasure and satisfaction I realise how kind it is — only an angel like you could have written so kindly... Life is a wild polyphony, but often a good woman like you can bring about some exquisite resolution of its discords. If there is any one here tonight whom I have not offended, I apologize! He came as a true friend, to share with me all my sorrow; he strengthened my heart as it was about to break, he lifted my thoughts, lightened, when it was possible, my spirits. In short, he was my friend in the fullest sense of the word. I can truly say, my children, that I have never loved a friend as I loved him; it is the most beautiful mutual understanding of two souls. I do not love him for his youthfulness, nor probably for any reason of flattered vanity. It is rather his elasticity of spirit, his fine gifted nature, his noble heart that I love... Joachim, too, as you know, was a true friend to me, but... it was really Johannes who bore me up... Believe all that I, your mother, have told you, and do not heed those small and envious souls who make light of my love and friendship, trying to bring up for question our beautiful relationship, which they neither fully understand nor ever could. Pyotr Ilyich Tchaikovsky, Diary entry for October 9, 1886, quoted in Nicolas Slonimsky, Lexicon of Musical Invective (1953), p. 73. Applying here Brahms' contributions to an unrestricted musical language will enable the opera composer to overcome the metrical handicaps of his libretto's prose; the production of melodies and other structural elements will not depend on the versification, on the meter, or on the absence of possibilities for repetitions. There will be no expansion necessary for mere formal reasons and changes of mood or character will not endanger the organization. The singer will be granted the opportunity to sing and to be heard; he will not be forced to recite on a single note, but will be offered melodic lines of interest; in a word, he will not be merely the one who pronounces the words in order to make the action understandable. He will be a singing instrument of the performance. It seems-if this is not wishful thinking-that some progress has already been made in this direction, some progress in the direction toward an unrestricted musical language which was inaugurated by Brahms the Progressive. This page was last edited on 24 January 2019, at 22:49.